Recipe submitted by Steven Cawood, Corporate Marketing Manager, Wal-Mart. 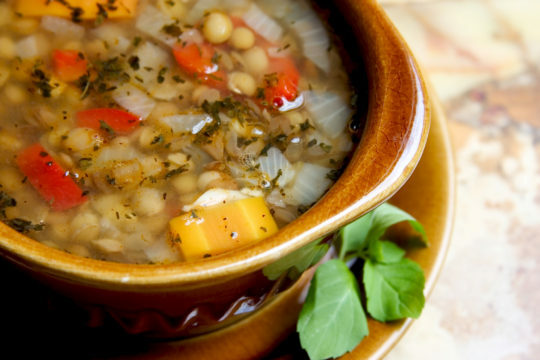 This hearty soup is full of veggies and tastes great! Warm up on a cool night with this healthy favorite! Serve with warm cornbread or your favorite "whole grain" bread. Stir in garlic, bay leaf, oregano and basil; cook for 2 minutes. Stir in lentils, and add water and tomatoes. Bring to a boil. Reduce heat, and simmer for at least 1 hour. This recipe makes about 6-8 (1 cup) servings.